Active Components: The data received from researches on this plant is insufficient. Of a wide range only bitters and resins have been found. Used for: The herb is a successful remedy for indigestion and upset stomach, torpid liver, constipation and common debility. It increases the appetite and is applied in minor doses to stimulate the digestive system for recovery. Moreover, balmony is effectively used to eliminate helminthes from the intestine tract. As a topical remedy the plant is used to treat eczema and sores. Additionally it can be used to reduce irritation and burning, associated with hemorrhoids. Balmony is on the first plane among herbs to be prescribed for liver conditions. It works as a stimulant on the gastro-intestinal tract and promotes absorption. It boosts the excretion of digestive liquids, and implements its purgative characteristics in the safest way. Balmony is applied as an aid for jaundice, gallbladder inflammations, and gall stones. It increases the appetite, soothes colic, treats biliousness, and dyspepsia. As a topical remedy the herb is applied for hemorrhoids, burning ulcers, and breast inflammations. It is specifically applied for jaundice associated with gall stones. According to homeopathists, this remedy is one of the best one for digestive debility, accompanied with jaundice. Balmony is commonly used to restore normal digestion after diseases and fevers, it is though insufficiently researched for its capability to soothe bowel pains. It is said to stimulate the digestive system, fight helmintes and cure catarrh, according to Kings Dispensatory. It is particularly effective in liver conditions and jaundice, and used for helminthes in form of decoction or powder, orally or in form of injection. To stimulate gastro-intestinal tract balmony is applied in minor doses, it has an especial value in the period of recovery from diseases, which were accompanied with fever, and produced a negative effect on the liver. The herb is applied in post-malaria conditions, to normalize the excretion of digestive system. It is topically applied for inflamed swellings, burning and inflamed ulcers, hemorrhoids, breast inflammations, and so on. According to Kings, it is particularly effective in digestive debility accompanied with jaundice, and treating helminthes. Additional Info: Balmony is a deciduous plant of a long lifespan, native to different regions of the US, from Florida to Newfoundland, and to Texas, Kansas, and Minnesota. Its straight growing stem can grow as high as 3 feet. Its green-colored leaves have an oblong form. 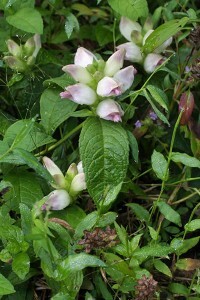 The plant blossoms from mid-summer to autumn, characterized by white to pinkish flowers. The fruit which appears after blooming is capsule-shaped. Preparation and Intake: For an infusion take 1 teaspoon of leaves and fill it up with 1 cup of boiling water. The dose is 1-2 cups per day. In form of tincture the plant is taken in a quantity of 15 drops an average, thrice a day. Commonly mixed with: To treat constipation Balmony is often mixed with Butternut. To treat jaundice a mixture of Balmony and Milk Thistle (Golden Seal, and other hepatic herbs) is applied.